Kuwait-based Al Mazaya Holdings yesterday inaugurated the Mazaya Logistics project built at an investment of BD7 million ($20m). Located in Bahrain Investment Wharf in Hidd, the project, which the company says was completed in a record time of seven months, features multi-purpose industrial units which can be used as warehouses, offices, industrial plant and workshops. 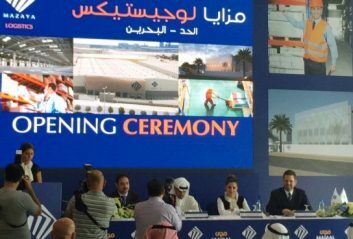 The company’s chief business development and marketing officer Salwa Nabil Malhas told a Press conference at the site yesterday that Mazaya Logistics is built on a plot spanning 27,605sqm and consists of industrial units of different leasable sizes totalling 15,250sqm. Forty-two industrial units, ranging from 250 to 500sqm and extendable to 15,000sqm coupon are available. According to Ms Malhas, it is believed to be “one of the most viable projects in Bahrain, being an integrated system designed to meet multiple industrial and investment requirements”. She said the project’s strategic location, adjacent to the Khalifa Bin Salman Port, near Bahrain International Airport and easily accessible from the Saudi Causeway, was well chosen. Al Mazaya’s chief of project management Abdulla Al Sultan, who was also present, said Bahrain was chosen as the first destination for the company’s foray into logistics, which is planned to be extended to local, regional and international markets. He added that Al Mazaya’s plan features key five projects across the GCC and Middle East region. Bahrain-based Majaal Warehouse Company was appointed as facilities and leasing manager for the project in February this year. The company’s managing director Amin Al Arrayed said it had supported Mazaya through both the design and construction phases of the project. “Majaal Warehouse Company has previously executed three similar projects in the same location which are fully leased. “We are building on our reputation as the preferred provider of industrial facilities in the kingdom, now delivering professional services to third parties, applying the skills and expertise we have developed managing our own properties since 2010,” Mr Al Arrayed said.